Публикувано от arcadia в 20:14 ч.
Sheena Brooks 6 януари 2014 г., 1:32 ч. Fantastic card for a guy! Thanks for joining us for our "Anything Goes" challenge at Yumi & Fumi Handmade! Sheena B (Team Fumi). arcadia 7 януари 2014 г., 21:59 ч.
Tracy 6 януари 2014 г., 2:23 ч.
Fabulous layout! You really used those chevron patterns in fun ways. Great coloring too. Thanks so much for joining us this week at Mo's! cebelica 6 януари 2014 г., 11:33 ч.
Ingrid Mason 6 януари 2014 г., 13:01 ч.
arcadia 7 януари 2014 г., 22:00 ч.
Mimi 6 януари 2014 г., 17:20 ч.
Katie Stringer 6 януари 2014 г., 17:21 ч.
Sunshine HoneyBee 6 януари 2014 г., 18:37 ч. 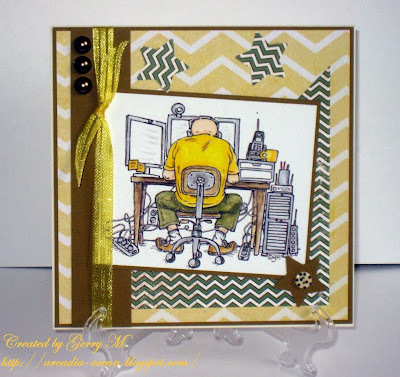 Like the computer theme masculine card. My hubby & I both have computer science degrees. I'm retired & he still works in the computer telecommunications industry. Our daughter is computer savvy like most young folks they rely on their computers. Thank you for entering OSAAT Ch194 Anything Goes. arcadia 7 януари 2014 г., 22:01 ч.
Melissa 6 януари 2014 г., 19:20 ч. What a great image and card! Thanks for joining us at Yumi & Fumi Handmade!! Vicky F. AKA Crafting Vicky 8 януари 2014 г., 4:14 ч.
Gorgeous card! I love the DP you have used for it and the little accents are just perfect. arcadia 8 януари 2014 г., 19:44 ч.
Amy Andrade 8 януари 2014 г., 22:41 ч.
arcadia 9 януари 2014 г., 8:13 ч.
Blankina 8 януари 2014 г., 23:03 ч.
Kat 9 януари 2014 г., 23:25 ч. Great male card. Love that image. Thanks for joining us at TG this week. arcadia 10 януари 2014 г., 20:44 ч.